Just like the cloth diaper laundry, I am surprised that I find baby food making a joy! Maybe I won’t feel this way in a few more months of it, but so far it’s much more fun than making dinner for hungry adults at 6pm every night. 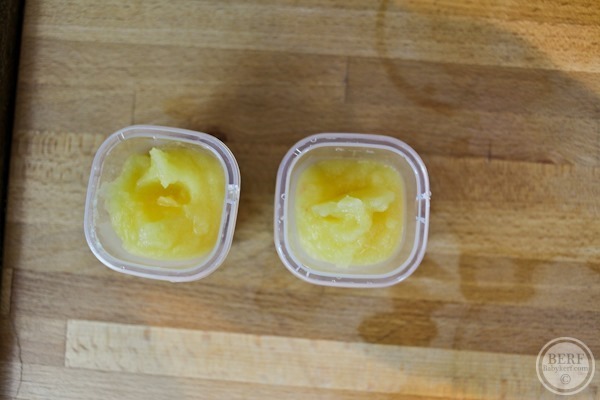 Baby food is so pure + simple. The star of the event is my new Cuisinart Smart Stick. 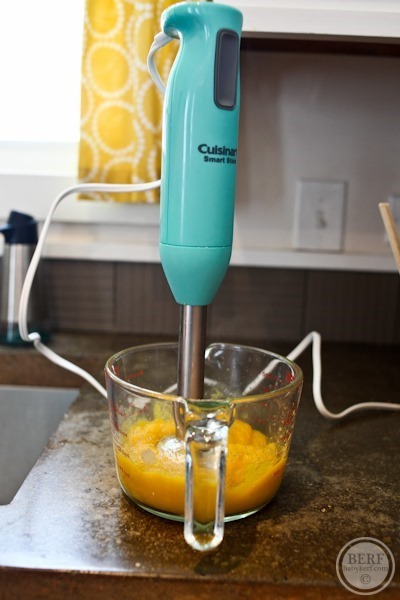 We used to have a stick blender that was battery operated. Matt hated it, and it always lost charge. We never used it and I gave it away. Then I started to miss having one and knew that it would be perfect for baby food. I was happy to find the Smart Stick in a rainbow of pretty colors for less than $30. A bonus: it’s dish washer safe (the bottom part) and plugs in so the power never fades! This book got me going. 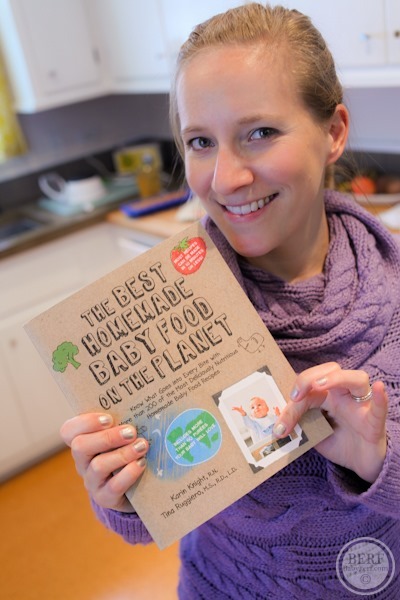 I got it as a shower gift and it was really helpful to provide some guidance on cooking and water levels as well as foods that are good for six month olds (although I think the latest research is more generous with a greater variety of foods than the guidelines in this book). Our first batch of baby foods included sweet potatoes, apples, oatmeal and peas. We microwaved the potato and then scooped out the insides to puree with a little water. The first round I just used an old ice cube tray and it worked just fine. 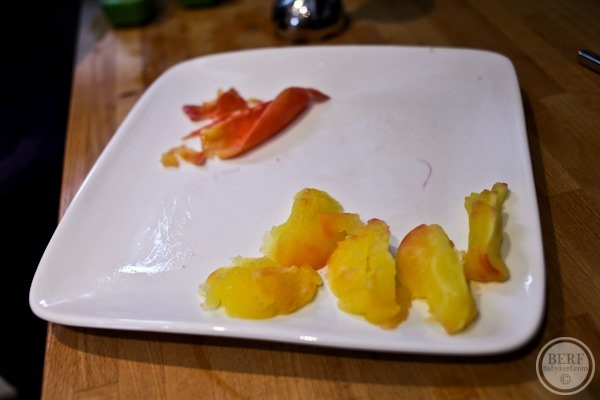 Apples, minus the skin, also got a blend with some water. Lastly, peas. Yummy! 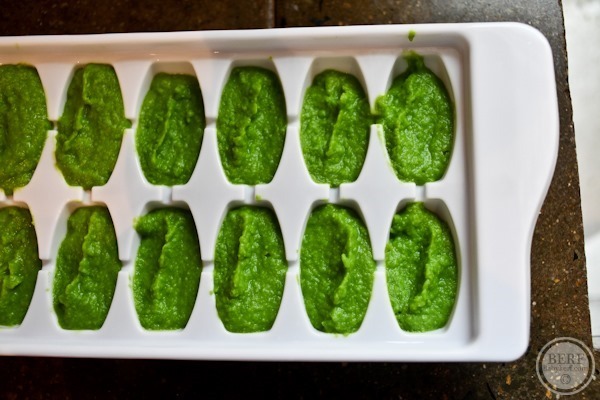 We just used frozen peas – so easy. 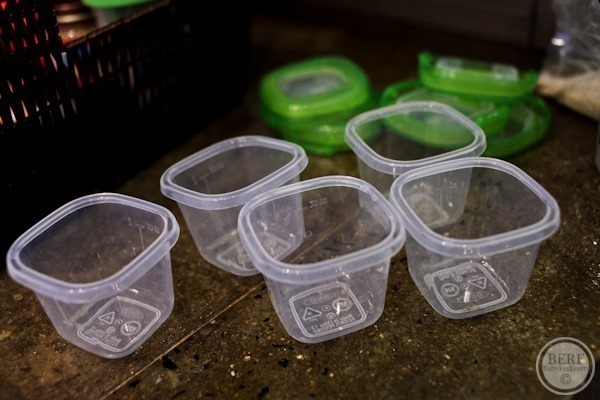 I bought some OXO Tot Baby Block containers to use for storage and freezing. They come with a little tray so they don’t get lost in the freezer. M loved all of his foods, and it was great to have them all ready in advance. I kept a few in the fridge and froze the rest. I get his frozen meals out the night before and then heat them up in the microwave (not to hot – just to luke warm – be careful of heating too much!) when it’s meal time. We also love this Boon Spoon that was a gift from a friend too! Just fill with food and squeeze out onto the spoon. 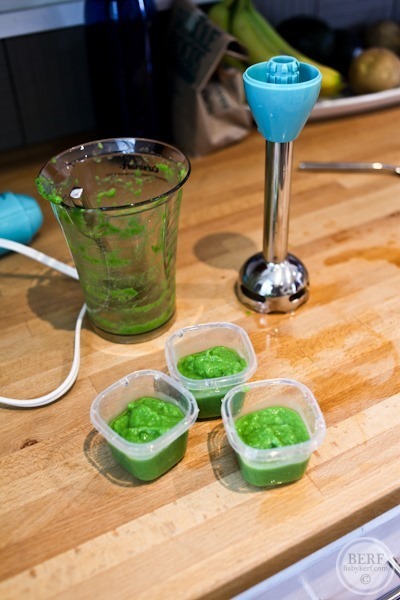 That recaps our first attempt at making baby food. Round II was even better! Coming soon. 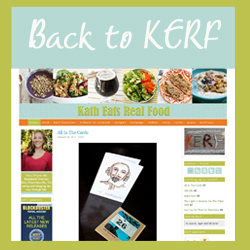 I have been searching your blog the past hr and was lucky enough to notice you just posted what I was looking for! Last night I gave my daughter, Victoria, green beans but I didn’t make a large batch; it was just enough for one meal. (I think I made it more complicated than it should have.) 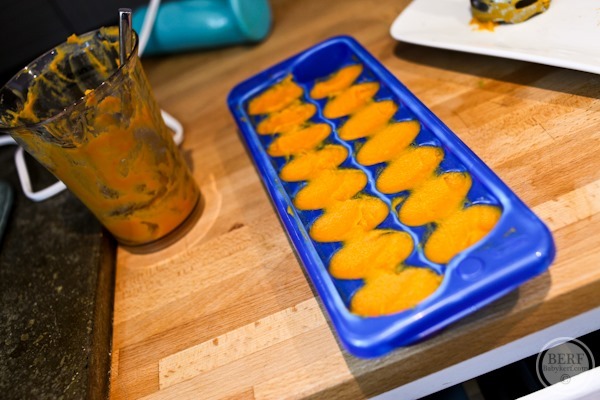 Tonight I will try it again and freeze the leftovers using an old ice tray and the amazing OXO Tot baby food storage that I registered for. 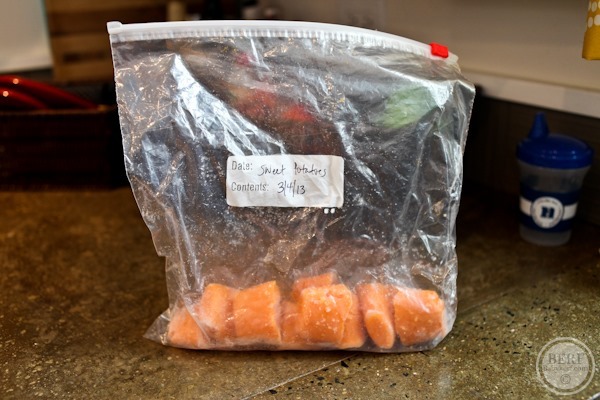 Great tip on leaving the frozen ones out the night before to thaw. How long do you microwave them for? Do you give Mazen one specific solid for a straight week to see if he has an allergies/ reactions to the food or do you mix it up during the week? 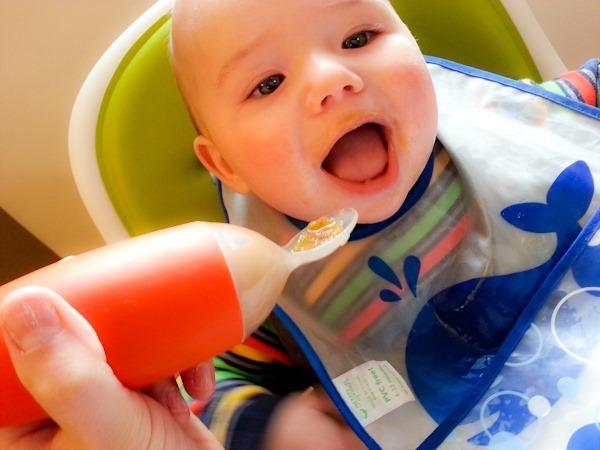 FYI, the current research-based guidelines for introducing babies to solids are that unless there’s a family history of allergies (check with your doctor to be sure if you’re concerned) there’s no need to introduce foods one at at time or wait any number of days between foods. 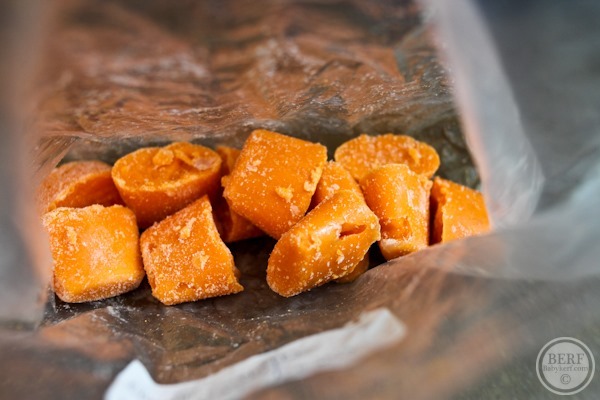 Avoid choking hazards, of course, but other than that, just feed them healthy food – you don’t have to stress about the details that everyone used to be instructed to worry about. Just an idea for a first food choice: avocado! We mashed ripe ones and our son loved them! He’s 17 months now and becoming quite a picky water but I can generally count on him eating diced avocados. Plus I feel good about the nutrition and good fats he’s getting. Avocado was our boys favorite first food! Now I blend them with some steamed pear and freeze it… makes an awesome teething popsicle 🙂 He loved the popsicles from about 8 months on! Okay…….I LOVE that spoon! They did not have anything out like that when my kids were small. What a great idea! 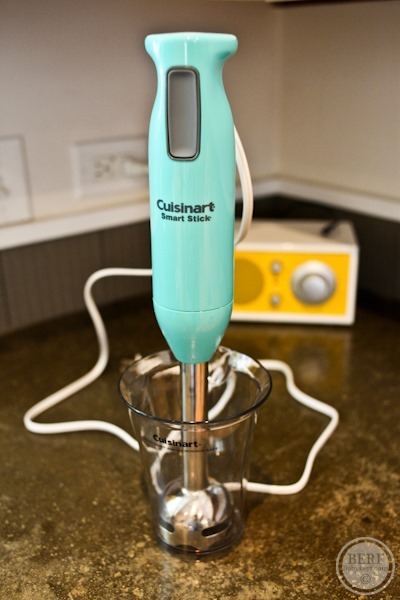 We have a similar stick blender and love it. It’s great for soups, etc. I can see that it would be ideal for making baby food, too. Nice pictures – the colors are so bright and vibrant on many of those foods. 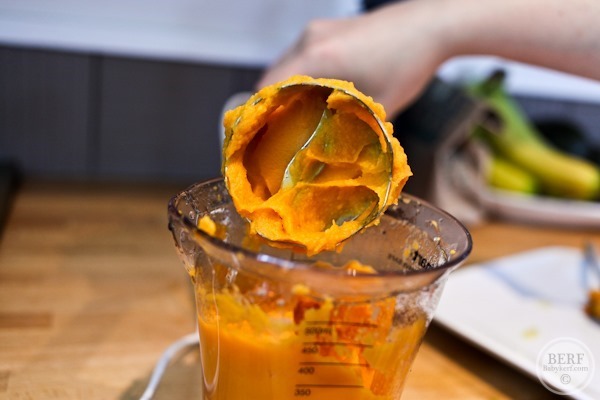 We didn’t make purees for our daughter – we took more of the baby-led-weaning approach, but we still love our plug-in stick blender for soups, sauces, etc. 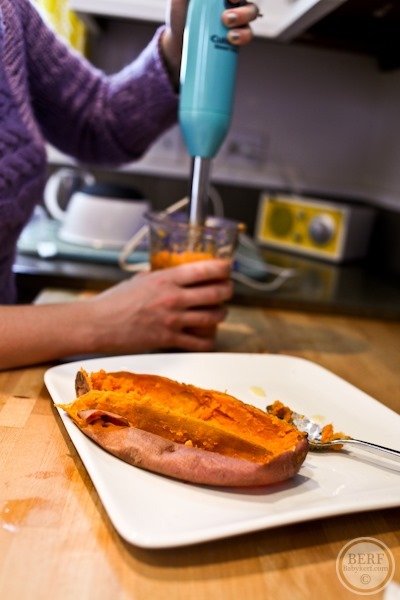 It’s a great kitchen gadget! I like that spoon! We fed our babies foods we ate just fork mashed pretty well. Our ped told us babies have a great gag reflex preventing them from choking in most situations. They obviously can choke but the point was not to be super fearful of small bits. I found this approach easy — no real prep or clean up. Now at 2 my girl hates anything puréed or smooth — I usually put granola in her yogurt or applesauce. My 6 mo old just started some mashed bananas, cinnamon and sweet potatoes, avocados and heavily steamed and mushed up broccoli with success. I forgot how much fun it is feeding small babies but I love when they start feeding themselves! I loved making baby food at first too. Then my guy started eating SO much and I was working too much so I ended up buying it. Now, looking back, I feel like the puree stage doesn’t really last all that long anyway!!! So much fun though!! Oh YAY! I have been waiting for you to start posting about baby food! My little guy is a bit older than Mazen, but I find that I get in a food rut with him. So it’s great to see what others are doing! And I NEVER get bored with making baby food. It’s so much fun and rewarding! Aren’t baby food colors so fun!! I have loved making my LO’s food. This week we ventured into parsnips and mango. I also got more lax on the 3 day rule but yesterday I gave two jars of new food from the store since I ran out of home-made (one corn and one that had banana) and she had a reaction. Now I don’t know what it was from. One of my friends let me borrow her copy of Annabelle Karmel’s book First Foods and it had so many fun, tasty options. I can’t wait to try some of those. How did you prepare the apples? Curious if you season/it’s okay to season the purees with salt? Adding salt is not recommended because babies’ kidneys can’t handle salt as well as adults (plus for the most part our diets have more than enough or even too much salt already). In our household we compromise a bit and don’t salt things that we’re preparing specifically for DD and just try to be reasonable when adding salt/soy sauce/etc to things that we’re all going to eat, but she’s almost 2 and has been eating what we eat for over a year now. There’s definitely no reason to add salt if you’re specifically making baby food, though. Don’t worry about things being bland – kids have very sensitive taste buds, and all of these flavors are new to them now anyway. Other herbs and spices are generally fine for babies, though. Our daughter even likes spicy food! 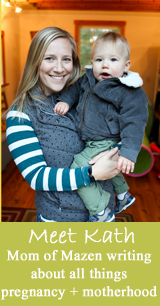 Hi Kath, mazen is too cute! I have a 7 month old and she’s a bit of a fuss pot in the food department. I’m trying to get her on a breakfast, lunch and dinner schedule. But she won’t eat the food for lunch…she only wants her bottle. I am doing cereal as her breakfast, but not sure if I’m just giving empty calories. Would you be so kind as to take me thru a day of mazen’s bottles and spoon feeding sessions? Thanks a ton! Ps… Have you tried yogurt yet? I tried the fage full fat plain.. She hated it and swatted at her face and my hands every time I gave it to her! It’s probably a little early for 3 meals per day. I’d just listen to her cues and skip lunch for now. We do breakfast and dinner now, and not always dinner but most days. Yes, he loved yogurt! Try the Yo Baby? Water Babies Pure and Simple is what we’re using. Emily, my second daughter is almost nine months old, but I felt a little overwhelmed when first beginning solids with her, just like I did with my first. Not as much, “what should I feed her?” but more worries about when and what if she doesn’t want it, etc. My pediatrician said at our six month appointment that she should be eating three meals a day by nine months, so that also felt like a lot of pressure. It took a first time mom, a friend of mine, to simplify it for me: at six months, just get then used to food. Feed them when it’s most convenient and they seem hungriest or most interested. For us that was dinner but only AFTER she’d nursed because even today she gets annoyed if she feels like we’re replacing nursing. At seven months, we tried to keep the constant dinner and add a second meal when it seemed convenient and she seemed interested. This was lunch for us. Once we got that down, at eight months (really 8.5 months), we started adding breakfast. Now she’s nine months old tomorrow and we are doing three meals a day. It has felt gradual and made sense to step it up by a meal a month, basically. Hope that helps!